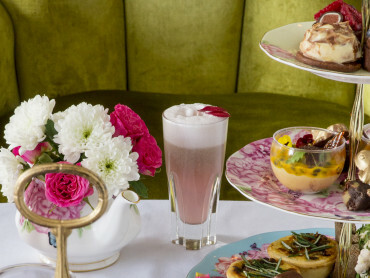 Ever since Anna Polyviou and her well-coiffed Mohawk stepped into the kitchen at Shangri La Sydney and onto the MasterChef stage, high tea has never been the same. From pavlova spikes to squirtable custard, this pastry queen isn’t afraid to have a little fun with her food. And you shouldn’t be either. 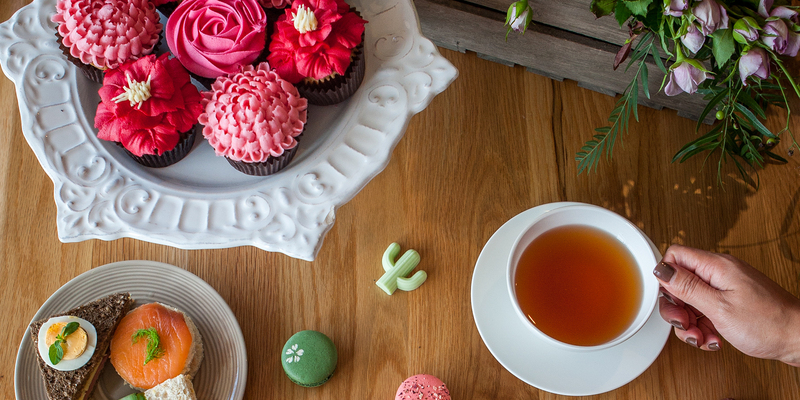 From sweets to styling, here’s our guide on how to host a high tea party with a twist! Pick a theme. Start a Pinterest board of your favourite table settings, flower arrangements, colours, cutlery, porcelain – use this board to build a vision in your head of what you want your party to look like. Are you having a big group of girlfriends over for a more casual affair where there’ll be plenty of laughter and laid back chatting, or is this an intimate soiree for a special occasion? Styling helps to set the mood. We’re going for a fun, energetic event so our boards are full of bright pops of colour and quirky details. We’re using gold as a feature, so we’ve selected a few key pieces, like a Kate Spade champagne bucket, a Kikki K water jug and beautiful Zara Home gold-rimmed glasses to build our board around. Don’t leave the menu until the morning of your event. Come on, we can all do better than a cucumber sandwich! 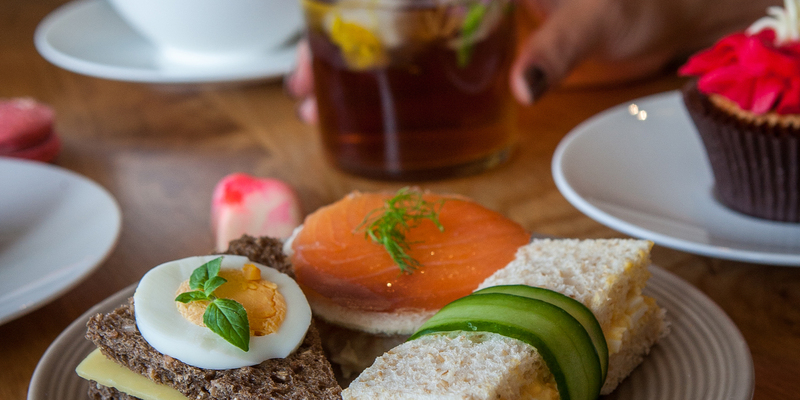 High tea is about little bite sized pieces packed with flavour. Start with the savouries and work your way through to sweets. Put a twist on the old classic – try crustless egg and mayo fingers wrapped in cucumber rolls or wholemeal smoked salmon and tuna sandwiches garnished with micro herbs. As you work through the menu, have a think about what drinks will be served alongside each dish. Will you pair a drink with each course? Champagne to start, with something like an ice tea to match the savouries can work nicely, before moving on to tea with sweets works nicely. Try a Fuze Crisp Apple & Lemongrass ice tea with rare roast beef and cheese sandwiches. And then there’s the sweets. Don’t skip the part when you can really get creative. 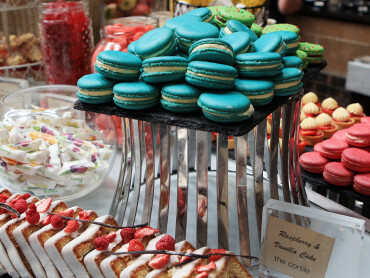 Forget profiteroles and fruit tarts – how about matcha macarons and lime and coconut pralines? 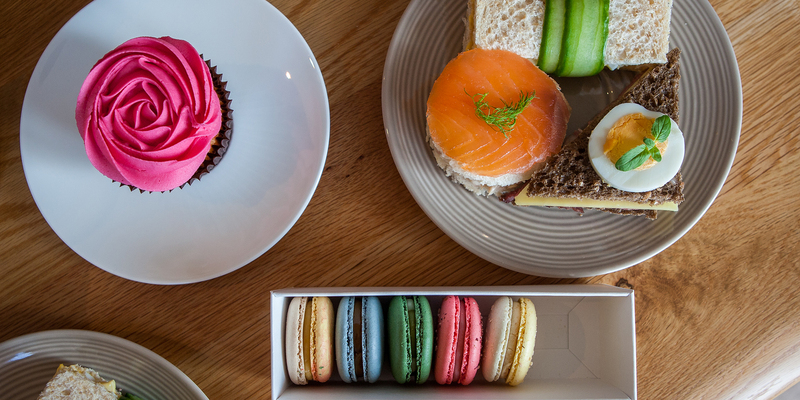 Our mouths are watering at the thought of MakMak’s marvelous macarons and Bakedown Cakery’s pastel coloured chocolate hearts. Or get busy getting creative with cupcake icing. Not a baker? We’re in love Cake and Bloom’s bright pink and fuchsia cupcakes that look a bouquet in a box. They’re guaranteed to wow the socks off your guests. So, the table. Once again, don’t leave this until your guests are on your doorstep! But, who has time to go all Downton Abbey these days? Put away your ruler Mr Carson, we won’t worry about having the tea cup 9 cm from each plate. We’re not even going to use a table cloth (have you ever tried ironing tablecloths? Not fun!). Instead, make sure you have a nice, clean surface, preferably a beautiful wooden table, give it a wipe down and then begin arranging your sweets on the table. Use little saucers to hold individual cupcakes and start arranging the macarons and chocolates around these larger features. One or two cake stands with extra sweets will add the wow factor, along with some fresh flowers draped casually in a crate or small vase. 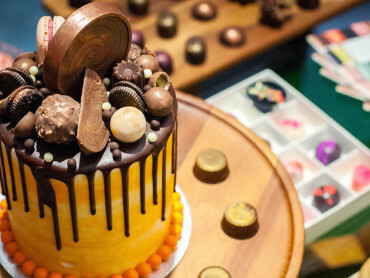 Creating an “edible table” takes the pomp and pressure out of your party. It’s something a little different that will capture your guests’ attention. Don’t forget to make sure there’s at least one of everything for each person. 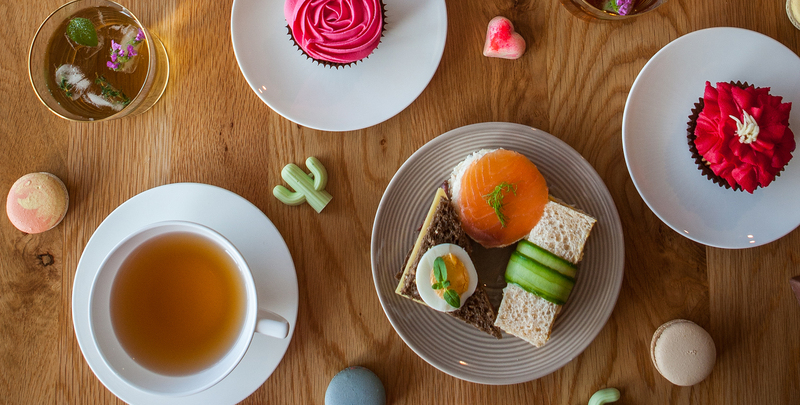 A high tea party doesn’t have to be over styled, over the top or even traditional to be a success, but you should take some time to think about are a few little touches. They won’t take long but they’ll make a big difference. The Fuze Tea Wild Raspberry and Hibiscus iced rooibos tea has a great deep pink colour that looks great in a glass – but, when you add a few edible flower ice cubes, it is irresistible. 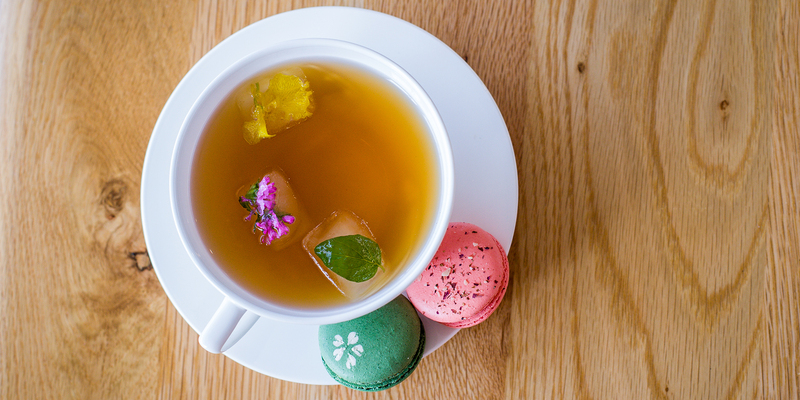 The trick with freezing edible flowers in your ice cubes is to boil the water before you freeze it. Boiling the water removes any dust or extra minerals so that when the water freezes, it will be crystal clear. No more cloudy cubes! Allow the water to clear before popping flowers into each cube. Obviously this needs to be done the night before! 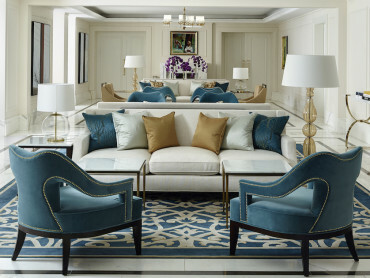 Think about a playlist; will you have crooning Michael Buble or something a little edgier? And what about napkins? Linen napkins add a little formality and there are plenty of fun paper napkin patterns out there. And last but not least, remember to have fun! Don’t take things too seriously. Never cry over spilt milk (make sure you ask your guests if they drink soy/almond/skim!). It’s a party so enjoy it! Watch out Martha Stewart, with these tips to hosting a high tea, you’ll be turning the high tea tables on their heads in no time.